Transport delicate and heavy loads smoothly over rough surfaces. 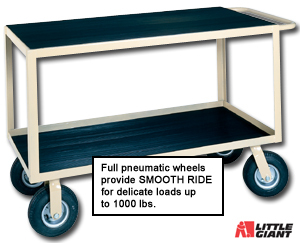 Large 9" x 3" full pneumatic wheels provide an "impact resistant" ride for instruments, electronics components, etc. Welded steel construction with heavy angle corners supports 1000 lb. loads. Steel tubular handle. Bottom shelf has 1-1/2" retaining lip. Top shelf available flush or with turned up lip. Available with non-slip vinyl laminated to shelf surfaces or smooth steel surfaces. Tan enamel finish. FOB Shipping Point. Product No. Size W x D x H Shelf Clearance Wt. (lbs.) Price Ea.